Central Florida is a strong community because some key players took a stand to make our community a better place. 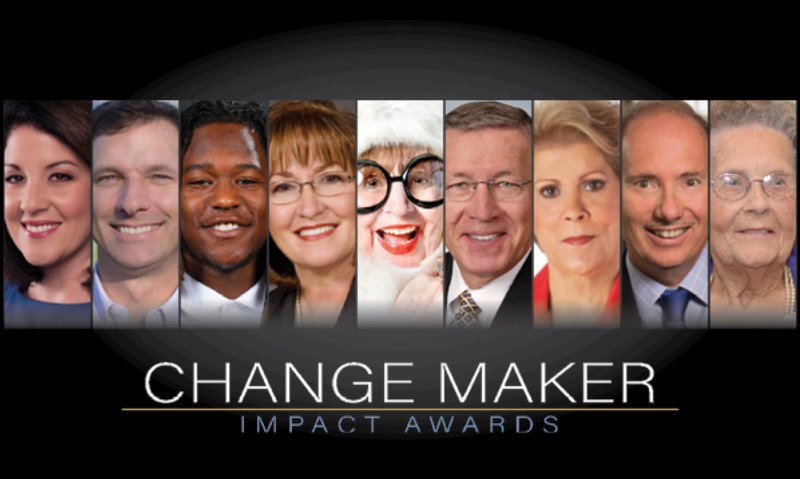 These Change Makers are at the forefront of improving lives which is why we are recognizing them at our inaugural Change Maker Impact Awards. It will take place on Monday, September 24 at the Ballroom at Church Street. Change Maker of the Year – For her unconditional support and leadership in responding to the Hurricane Maria evacuee crisis in Central Florida. Ground Breaker – Former UCF Linebacker for his determination to overcome adversity and inspiring youth with disabilities to achieve their full potential. Ground Breaker – The high-tech sensor manufacturing facility changing the face of the economy in Osceola County for inspiring a region through innovation and cultivating new economic opportunities for the future. Impact Leader for Philanthropy – For blessing so many in Central Florida with the resources they need to shine brightly and lead better lives. Impact Leader for Advocacy – For her heroics in giving hope to the hopeless and saving the lives of dozens of children following Hurricane Maria. Impact Leader for Advocacy – Reporter for WFTV for giving a strong voice to those unable to speak for themselves in the aftermath of Hurricane Maria. Impact Leader for Volunteerism – Long-time community volunteer and executive board member for his leadership, vision and devotion to many in Central Florida through volunteerism. Impact Leader for Collaboration – CEO of Florida Citrus Sports and a driving force as a board member of LIFT Orlando for creating collaboration to break the cycle of poverty and transform neighborhoods. Unsung Hero– For 25 years of volunteer service cooking thousands of meals for the working poor and homeless at Christian Service Center. Public nomination led to the selection of Mrs. Bean, who will receive a $500 grant to donate to the nonprofit of her choice. Another important aspect of the event will be recognizing our inaugural class of Legacy Honorees. These are the Change Makers who have contributed faithfully year after year to ensuring our community thrives. • Publix Super Markets, Inc. The Change Maker Impact Awards will be held on Monday, September 24, 2018 at The Ballroom at Church Street. It begins with a Community Connection Speed Networking Reception at 5:30 P.M. to connect individuals looking for meaningful volunteer opportunities with nonprofits in need of skilled volunteerism, board members and committee leaders. The networking reception will be followed by dinner and award show to honor this distinguished group who are crucial to our community.